Tired of picking up pet waste in your RV park or campground? 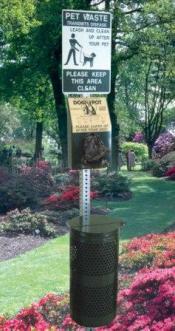 Provide dog owners the means to pick up after their dogs with our Dogipot® pet waste stations. These dog waste receptacles provide pet owners dog poop bags to pick up waste and a trash can to dispose of the pet waste. What could be easier for dog owners? A sign reminds dog owners of their duty to pick up after their pets. Dogipot® has developed this ingenious dog waste station. It stands out from all competitive products as the most economical and practical tool on the market to motivate dog owners to pick up after their pets. We also offer the Dogipot pet waste station with an aluminum receptacle. See below in Related Products section for details. Go to top of this Dogipot Pet Station with Steel Receptacle 1003-L page.